With their predilection for prolonged mourning and children who were seen but not heard, the Victorians have tended to be associated with moral solemnity. But they were not just bombazine-clad poker faces. 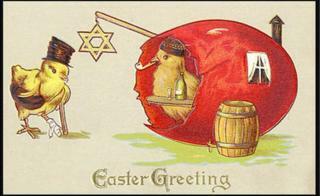 They loved to send greetings cards at the drop of a hat - and Easter was as good an excuse as any. According to the Greeting Card Association we are sending more cards today than ever before - although not many of us habitually send Easter cards. But in the 1870s, the introduction of the halfpenny stamp meant sending cards was affordable for almost everyone - and it became something of a craze. The idea of posting Christmas cards was leapt upon and it was natural for the next Christian festival to follow. Image caption So many questions: Why are they naked? Why have they been furnished with special hammers? Perhaps unusually for a society often considered to have been sickly-sweet and sentimental, as well as deeply principled, their Easter cards were not particularly religious in tone. But unlike their Christmas cards they were in keeping with the holiday. At Easter, kittens, eggs and energetic hares bounded and abounded. Helen Jones, who collects and deals in Victoriana, said the Victorians were especially fond of the unusual and even enjoyed "freak shows", in which people with "physical peculiarities" were put on display. Such diversions were popular enough for permanent venues to be established, including one at London's Egyptian Hall. Image caption "What do you mean, you want a DNA test?" "One great favourite was a woman who had no hands or fingers, but used to crochet using her feet. She travelled all over Europe and was invited into the homes of rich people. "So although we might see some of these cards as a bit odd, in context they are actually pretty tame." According to the Library of Birmingham, making scrapbooks became a popular pastime for wealthy children and women, who would have created their own albums as keepsakes and to share with others. Cards would be pasted into albums along with decorative chromolithographs or "scraps" and other ephemera of the period. Unusual pictures would be especially valued. "I'd have thought any Victorian album-maker would be delighted to have some of these," Miss Jones said. "And I'd also hope they'd be pleased we still enjoy them today. "If 'enjoy' is the right word."